With the advent of programs like Who Do You Think You Are produced by Lisa Kudrow and Henry Louis Gates’ Finding Your Roots on PBS, genealogy research has become even more popular than before, particularly with more and more resources available online. Did you ever wonder about the genealogical history of Seton Hall? It may seem when one looks at the campus today as if the college was always here in South Orange. 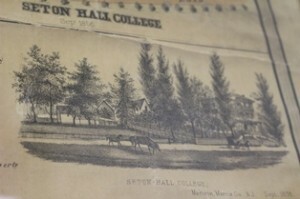 In fact, according to a history of Seton Hall College written in 1895 by then President Rev. William F. Marshall, printed in that year’s catalogue, “When James Roosevelt Bayley [Mother Seton’s nephew] was appointed Bishop of the newly erected See of Newark, New Jersey, October 30th, 1853, he found the diocese poorly supplied with priests and with no Catholic institutions of any kind… save a few scattered churches and chapels.” He decided to establish a college for the education of both secular students and theological students training to be future priests. He and Rev. Bernard J. McQuaid who would one day become both a bishop himself, and the first president of Seton Hall College searched to find a proper location for the college. They settled upon Madame Chegary’s Young Ladies’ Academy in Madison. Madame was relocating her school to New York City, vacating the white frame building that can be seen in a drawing on a sizable map from 1857 that hangs just inside the entrance to the Msgr. William Noé Field Archives and Special Collections Center in the Walsh Library. The inset drawing seen below of the building amid trees with a horse and carriage in the foreground notes the date Sept. 1856 when the first class of students began their studies – all five of them including Leo G. Thebaud, Louis and Alfred Boisaubin of Madison, John Moore of New York City and Peter Meehan of Hoboken. Rev. Marshall tells us, “Before the end of the month twenty additional names were registered,” clearly showing that this new college was filling a need. Bishop Bayley named the college for his aunt, now St. Elizabeth Ann Seton, who preceded him in converting from the Protestant Episcopal Church to Catholicism, and who was the founder not only of the Sisters of Charity, but also of Catholic education in this country. Bishop Bayley found traveling to his newly established college from Newark by horse and carriage too time consuming, and by 1859 the college had outgrown the small, white building in Madison. Returning from unsuccessful scouting for a new location along the South Orange and Newark Turnpike, Bishop Bayley spied a white marble villa on his right. A Catholic real estate dealer of Valisburg was commissioned to make the purchase of the Elphinstone Manor which stood where Presidents Hall does now. 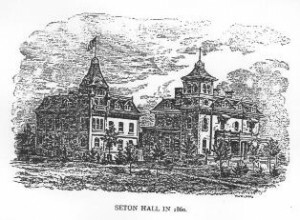 Formal transfer was effected on 2 April 1860, and Seton Hall College moved from Madison to South Orange. The College of St. Elizabeth now occupies the site of the original Seton Hall College where the white frame building still stands. 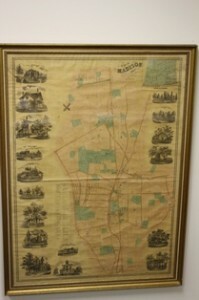 To see the map of Madison, please drop in during our hours, M-F, 9-5. We are the Archive for Seton Hall University and for the Archdiocese of Newark, and have an extensive collection of manuscripts, photographs, rare books and artifacts. If you have a paper or project which requires primary source material on the history of Seton Hall University or the Archdiocese, or you wish to research your family history using local Church records, please make an appointment to come in to confer with our staff and use some of the materials we conserve. Contact archives@shu.edu or 973-761-9476.